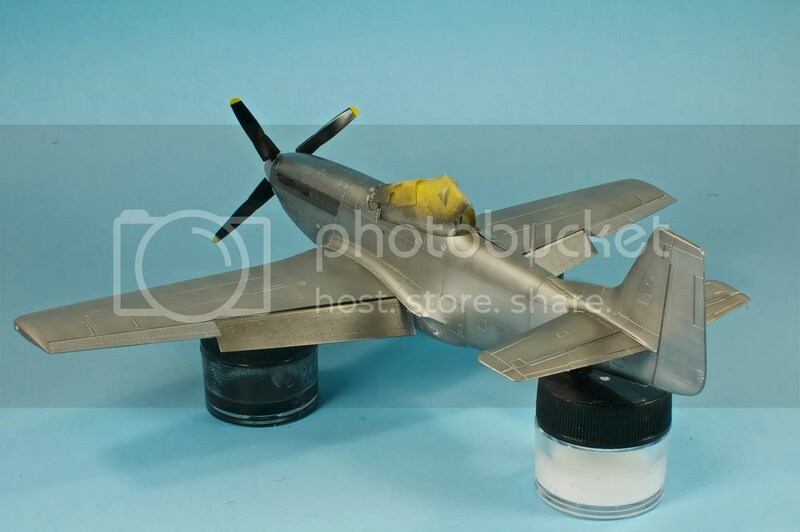 I got an alert this morning that my big 1/32 P-51 is currently en route to Mesquite, TX, and should be reaching Austin and my doorstep sometime tomorrow! As excited as I am to behold Tamiya’s latest achievement in all its glory, there’s still that matter of its smaller sibling. 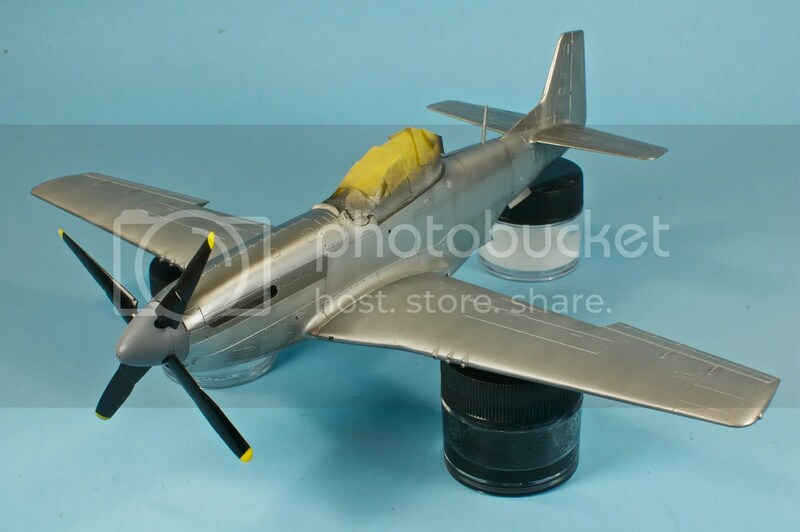 Oh, and that big Spitfire that’s caught in the slow grind that is the engine build-out. 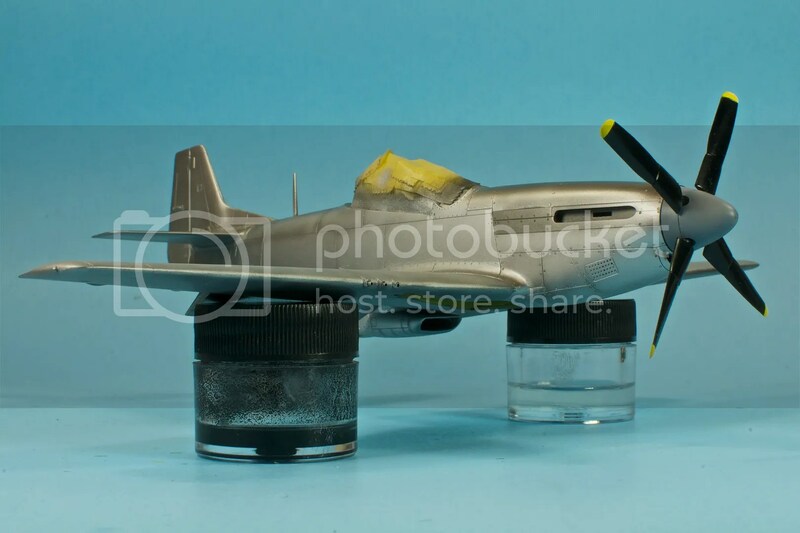 I swear that Merlin 60 and its associated ductwork and mounting frames probably contains a higher total parts count than the 1/48 P-51! But…back to the quarter scale Mustang. 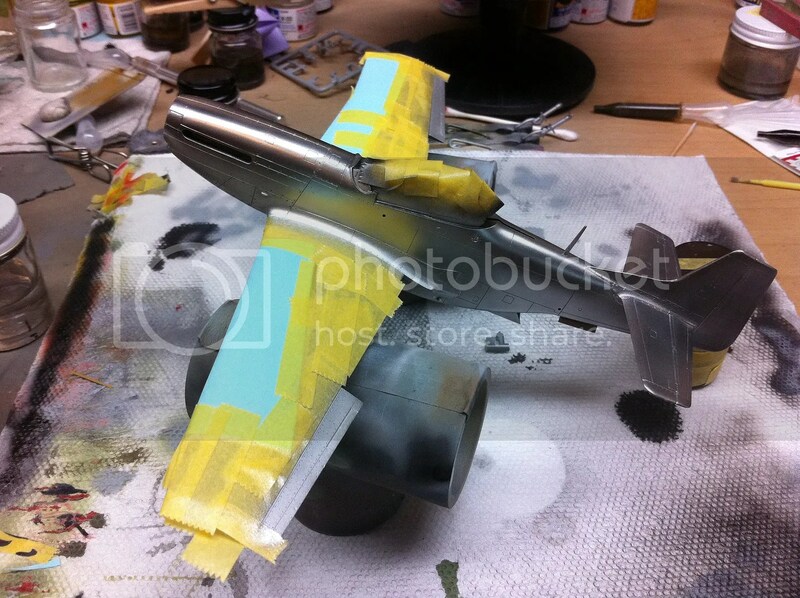 When I left off, main assembly was complete, the wing seams had been filled, and it was time for paint. Before moving on the the natural metal side of things, I had to take care of a few minor painting tasks, including the wheel wells with zinc chromate (I chose Tamiya’s excellent XF-4 Yellow Green cut with a dash of XF-5 Green) and testing the seam-filling with some primer. The seams were still visible, so I went back with actual putty. More filling, more sanding! Once I was happy, I masked off the cockpit and covered the gear bays with the kit doors, held in place with white tack. They fit, make excellent masks, and I’m replacing them with resin anyway, so why not use them as masks? Since coming back to the hobby last year, I’ve done elements of natural metal finish. My two Early Wildcats were finished with metalizers, though they were seeking to approximate the silver lacquer paint the Navy used the in pre-war period, not bare aluminum cladding. 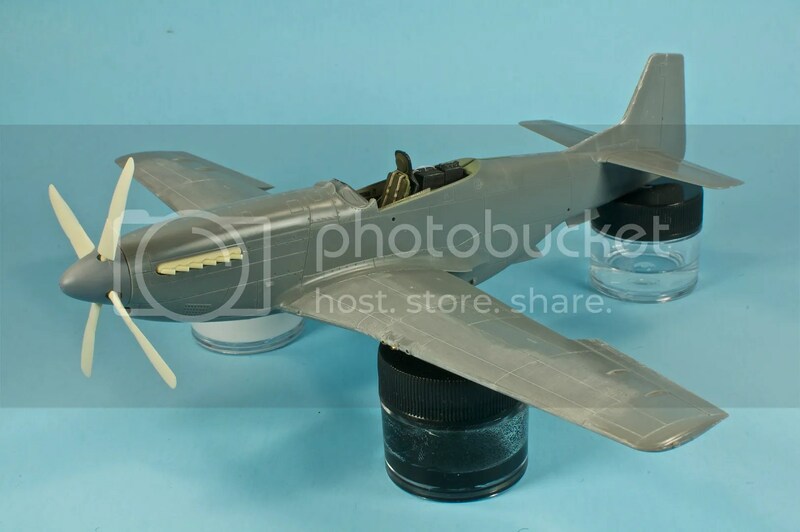 I also used metalizers on the cowl rings and exhaust plates of Zvezda’s excellent La-5, and the replaced port wing on David Schilling’s P-47. But this is my first full-bore natural metal finish in almost twenty years! I planned to use Alclad II metallic lacquers from the outset, and their high-shine Airframe Aluminum as a base for the fuselage finish. This necessitated a gloss black base, and I’ve read time and again that Krylon Fusion works very well for these purposes. So I decanted some, sprayed it, and INSERT STREAM OF EXPLETIVES HERE. I’m not entirely sure what caused this degree of fail…I’m guessing just the general heat and humidity of the Texas summer…and a summer that’s proving far more ridiculous in both regards that any in the last ten years. After much grumbling, I busted out multiple grits of sandpaper and sanded this abomination back to smooth, then applied Alclad microfilling primer on top. It dusted a bit, but a thorough polishing with micro-mesh cloths yielded a perfect finish. 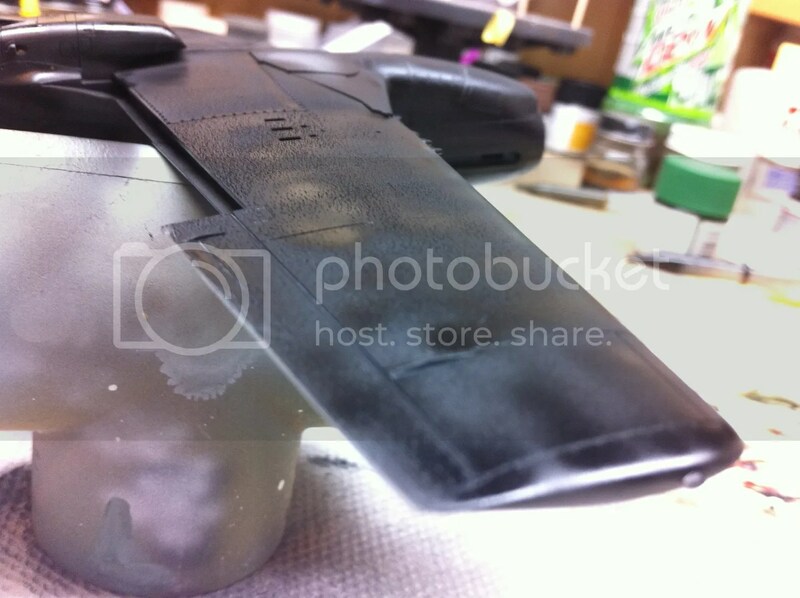 I topped this with a coat of Tamiya X-1 Gloss Black mixed with 25% X-22 Clear, and thinned with Mr. Leveling Thinner. This was then micro-meshed and ready for the Alclad. I started with the wings, using Alclad Semi-Matte Aluminum to represent the aluminum lacquer paint used to coat the wings and cover the filled seams. The wings were then masked, and the high-shine Airframe Aluminum was applied to the fuselage. High-shine, indeed! So, using the semi-transparent Airframe Aluminum as a base, I came back and hit different panels with Aluminum, Duraluminum, and Magnesium. The idea was to provide some shading, depth, and a sense of wear, as opposed to a showroom-fresh look. Coming out the other side, I’m very happy with where this ended up, especially considering the early prep issues. Next up, painting the blue nose and applying the decals. I’m still making up my mind if I want to try to use Alclad’s clear coat sealers or not…we shall see. Had the same bubbling with fussion black on an F-86 I did back in early may. Now I live over in Sweltering Humid South Carolina and do all my spraying out in my shed. Was a very warm day,..about 92 and was not very humid that day so I sprayed….Bubbles!! I then sprayed a Test mule that was primed with auto primer,…same thing! 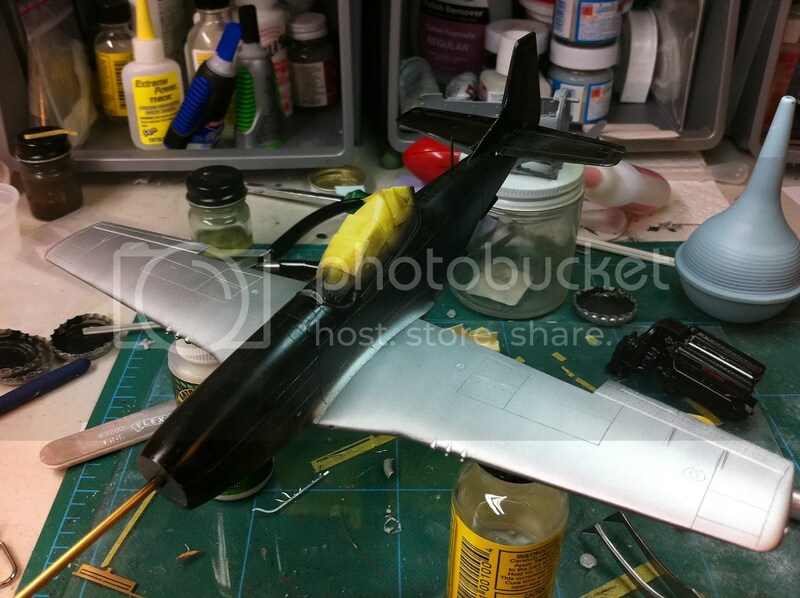 I stripped the F-86 then wiped down with mineral spirits and tried it right from the spray can…….nice coat!…hmmmmm. Was it the primer,.the can… the mineral spirits? 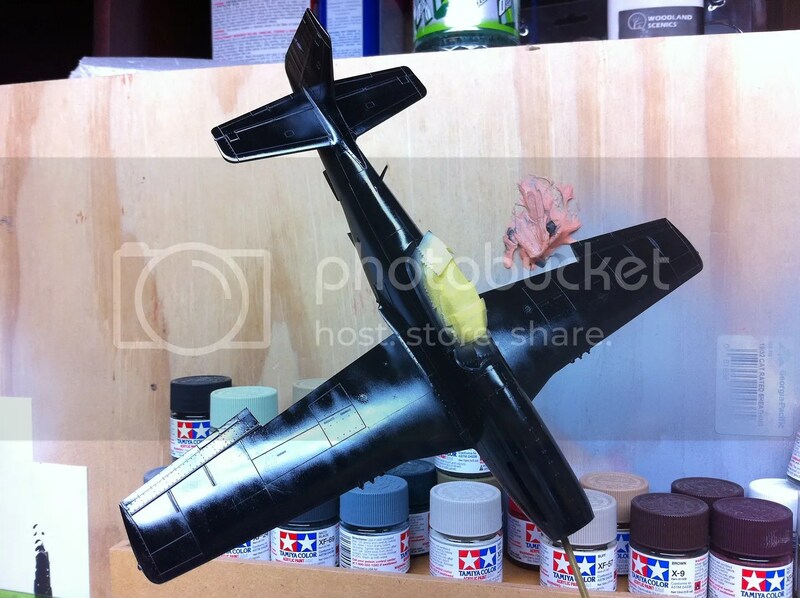 Last week I shoot a f104 with black on first….the paint wouldnt cure out….it rubbed off with mild touching and handling and lifted with any masking I needed to do. 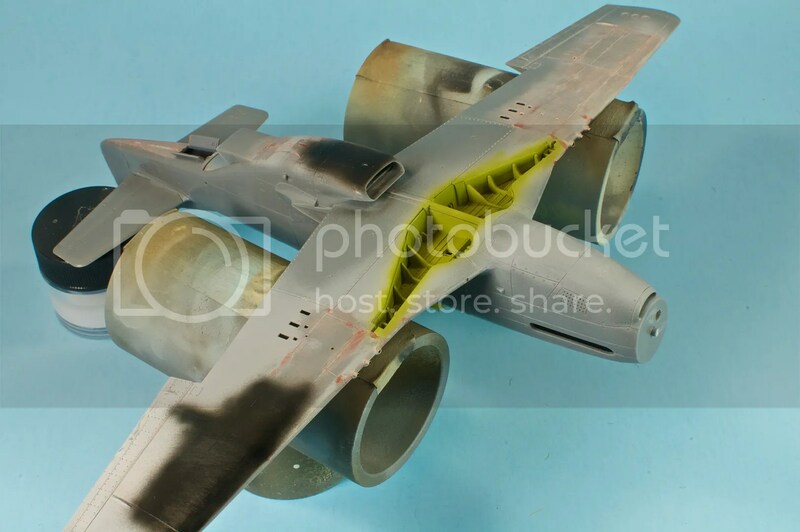 It was Alclad 2 airframe aluminium……this has never happened before these two incidents. What gives? Im guessing its a bad batch!…anyway…model on my friend…looking good! Terrific updates Doog’s keep them coming, you have a flair for this stuff!